Sri Lanka have won the toss, and asked India to bat first in the second and penultimate match of the three-match series here at the Vidarbha Cricket Association (VCA) Stadium in Jamtha. After being asked to field first, skipper Virat Kohli expressed that had he won the toss he would have opted to bat first. As the Dinesh Chandimal-led side have decided to go with the same squad, India have announced three changes in the playing XI. As right-arm bowler Mohammed Shami has a niggle in left hip, Ishant Sharma, the most capped player in the current Test squad with 77 matches in whites will join the squad. Rohit Sharma will replace speedster Bhuvneshwar Kumar. India will play without opener Shikhar Dhawan in the squad. Instead, India's most technically equipped opener Murali Vijay will partner KL Rahul for the opening slot. 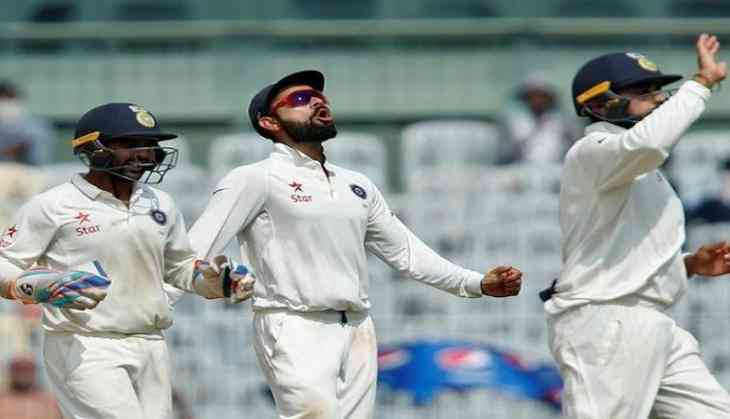 India: Virat Kohli (c), Lokesh Rahul, Murali Vijay, Cheteshwar Pujara, Ajinkya Rahane, Wriddhiman Saha (WK), Ravichandran Ashwin, Ravindra Jadeja, Umesh Yadav, Ishant Sharma, and Rohit Sharma. Sri Lanka: Dinesh Chandimal (c), Angelo Mathews, Dimuth Karunaratne, Niroshan Dickwella (WK), Suranga Lakmal, Dasun Shanaka, Viswa Fernando, Lahiru Gamage, Sadeera Samarawickrama, Dilruwan Perera Rangana Herath, Lahiru Thirimanne.